Dimensions 0.25 by 5 by 8 in. 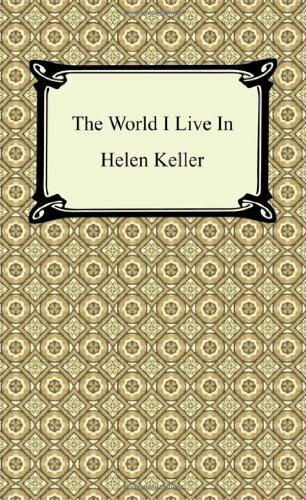 Amazon.com description: Product Description: Helen Keller (1880-1968) was an American author, lecturer, and political activist. At nineteen months, she suffered an illness that left her deaf, blind, and eventually mute. Helen remained in a lonely state of sensory deprivation until she reached the age of six, when Anne Sullivan (also visually impaired) was employed by the Keller family to tutor her. As a member of the Socialist Party of America and the Wobblies, Helen campaigned for women's suffrage, worker's rights, and socialism, as well as many other leftist causes. She was the first deaf and blind person to earn a Bachelor of Arts degree. After her 1904 graduation from Radcliffe with honors in German and English, Helen wrote profusely, completing a total of 12 published books and numerous articles. "The World I live In" (1908) offers Helen's remarkable insight of the world's beauty perceived through the sensations of touch, smell, and vibration, together with the workings of a powerful imagination. It is her most personal and intellectually adventurous work that transforms a reader's appreciation for her extraordinary achievements. About: I HAVE just touched my dog. About: Helen Keller (1880-1968) was an American author, lecturer, and political activist.